Feature: 3-colors LED, Crack keyboard,19 keys do not conflict.It is exclusive cooling gaming keyboard to offer the most comfortable gaming environment.Subtle ergonomic design, the most subtle touch.19 keys with no breakthrough. The humble mouse is easy to overlook in a PC setup, for example I’ve used a low cost Microsoft mouse for years, it did everything I needed, had back and forward buttons on it, and was OK to use for long periods of time. However for very little money EC Technology can provide you with an alternative, one which, because of the low cost, I wasn’t expecting to be much better than my existing trust mouse. Turns out even at a low price point you can get a really good bit of kit suitable for lots of different PC roles. The designers have done a great job on creating a mouse which is very comfortable to hold, far more so than my previous mouse. It’s also a nice looking mouse, it has a sleek aggressive look to it. This is a right handed mouse which has the back/forward buttons on the left hand side, easily thumb clickable, and has a really nice finish to it which makes it feel of higher quality than expected at this price point. It comes with a good length cable so you shouldn’t have any issues if your PC is stored under your desk. As well as the usual scroll wheel the mouse has an additional switch, one that quickly adjusts the DPI (how fast your mouse pointer moves around). 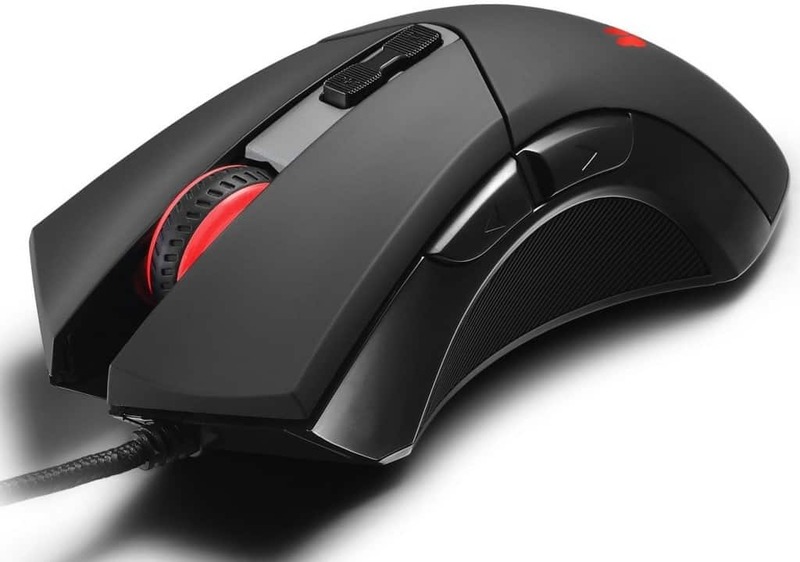 This makes it a great allround mouse, on the desktop you can lower to 800 DPI to ensure your cursor isn’t flying across the screen too quickly, then when in game you can pump it up to 2400 DPI allowing you to, for example, quickly spin around in a FPS. Download and install the driver software and you can tinker further, the software looks crisp and clean and is very easy to use, for example setting specific commands to the back/forward buttons or creating different button profiles. This is useful if you’ve assigned game specific functions to the mouse as you could have a ‘desktop’ profile and a ‘game’ profile. The gaming mouse features a light on the back which changes colour depending on which DPI setting you’re using.